Looking for Office reception design ideas? Read on to know about Office Reception Design and decorating Ideas to get the right look which can leave a long lasting impression on your visitors as they enter in your office. We all know that reception is one of the most important areas of any office which makes the first and last impression about the office and the employees on clientele, visitors and vendors. So it should be carefully designed to look not only professional, but stylish and functional too which helps in building a welcoming and inviting atmosphere within the office. Here we are with some office reception design ideas that you can consider before finalizing the reception design to convey the correct message and help to build a right impression and brand value on your visitors. Before designing an office reception, first estimate the overall appearance and feel that you want to offer in the reception space. It should be designed in a way that it reflects the overall look of your company as well as looks sleek, cozy or creative which is able to cater the clients' requirements. -	Color scheme for reception: Choose the right color scheme for reception; do not use very bold colors. Go for Earthy shades and light tones such as blue, green or yellow as they goes well with a number of furniture and furnishing varieties. Do not select the color because you have seen it in many offices; first visualize the design and the colour combinations which you want to use than go for it. Paint one of the walls with bright colour like pistachio green to create a focal point and other four walls with some other colour off white will be the best choice. You can also go for 3D walls and 3D wall panels to modernize the office look. -	Office Reception furniture: Once you decide the color scheme for reception, it's time to choose furniture. When you are looking into reception furniture, you need to think about the type of business you are in. Reception furniture should be comfortable and durable. 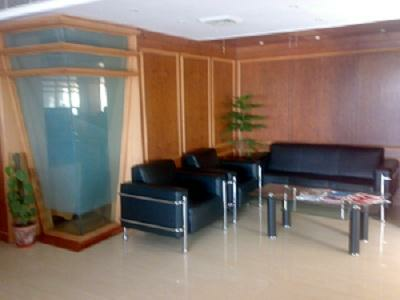 Place comfortable chairs, sofa and centre table for your visitors in the reception. Good and comfortable furniture makes the reception look attractive and friendly. Office reception furniture should include a desk for the receptionist and a sitting area for the guests, that much furniture is sufficient do not overcrowd it with extra furniture. Always choose furniture according to the area you have. The office should not be cramped but allow easy movement with enough room to open cabinets, drawers, and easily move the desks and chairs and feel squashed. People should also easily enter and exit the office easily. 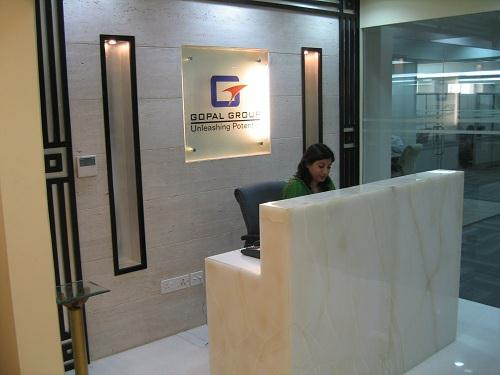 -	Office Reception flooring is an essential element to complete the look of your reception area. There are many flooring option are available in the market like laminate flooring, tile flooring, hardwood flooring, vinyl flooring you can choose any of them keeping the functionality aspect in mind. You can also use carpets and floor rugs to create a warm atmosphere. No matter what kind of flooring you use, it should be maintained and kept clean and clutter free. -	Office Reception lighting should be functional and able to create a desired ambience. Use recessed light which are attached to the ceiling for sufficient light. You can hang Suspended or Pendant Lights above the reception desk to get sufficient light and to create a visual interest. Wall sconces made of glass, wood or metal can also be fixed high on the walls. Focus and task lights can also be used for reception interiors for highlighting a particular area of the office reception. -	Accessories for Office Reception should be choose carefully. There are many options for wall accessories that can decorate your office reception area and they must complement the decor you have created. A small flower vase on reception desk, a nice picture or painting, your company logo on wall, some book shelves on the wall will make your décor complete. Place your organizations logo on the entrance, in front of the desk or on the wall behind the reception desk. Some green plants can also enhance the beauty of you reception area and also makes you environment friendly. We hope the above suggestions will help you to get a perfect office reception.